For fighter info, see Corrin (SSB4) and Corrin (SSBU). Official artwork of Corrin from Fire Emblem Warriors. 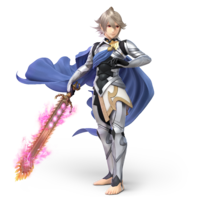 Corrin (カムイ, Kamui) is the main protagonist and player avatar of Fire Emblem Fates. Like Mark in Fire Emblem, Kris in Fire Emblem: New Mystery of the Emblem: Heroes of Light and Shadow, and Robin in Fire Emblem Awakening, Corrin is the customizable avatar character in Fire Emblem Fates. Unlike the others, however, they are also the main character of the story, having the most prominent role of an avatar character in a Fire Emblem game. Corrin's gender, physical appearance, voice, stat builds, and secondary class can be selected by the player before playing. Corrin is notably half-dragon, being able to transform parts of their body into that of a dragon, or temporarily transform into a dragon with the power of Dragonstones. Corrin and their royal families can use Dragon Vein, a power granted from the ancestral First Dragons, which can be used alter the user's surrounding terrain in a multitude of ways. Fire Emblem Fates centers around two kingdoms: the militant kingdom of Nohr, which is where Corrin grew up after being abducted, and the peaceful kingdom of Hoshido, where Corrin was born. In the beginning of the story, Corrin becomes of age after they best their older brother, Xander, in a practice match. King Garon of Nohr provides Corrin with the sword Ganglari to be used on the Hoshidan prisoners Kaze and Rinkah, among others. Corrin succeeds in defeating the prisoners, but refuses to kill them, due to their kind personality. Enraged, Garon has Xander kill the prisoners instead, but Corrin refuses to allow it and briefly clashes with Xander, only for the argument to end when Leo "dispatches" the prisoners, secretly weakening them enough not to be killed and convinces Garon to lessen Corrin's punishment. Garon decides to send Corrin to inspect a Hoshidan fortress above the Bottomless Canyon to pardon their crime. However, one of Garon's men, Hans, provokes the Hoshidans into battle and knocks Gunter, one of Corrin's companions, into the abyss of the canyon. Hoshidan soldiers soon find and capture Corrin, who eventually recognize them as the long-lost member of the Hoshidan royal family. Corrin then meets their blood relatives and the songstress Azura, a former Nohrian Princess raised in Hoshido, at the capital city. However, a hooded assassin attempts to kill Corrin, with Corrin's mother, Queen Mikoto, shielding them at the cost of her life. Distraught at her death, Corrin transforms into their dragon form for the first time and goes on a rampage. During this time, invisible soldiers continue to attack Hoshido; they and the hooded assassin are driven back by Corrin and their allies. Corrin continues their rampage, but is calmed down by Azura, who sings Lost in Thoughts All Alone to revert them to their human form. In the aftermath, Corrin comes to possess the legendary Yato blade, which is said to belong to the one who will save the world. Corrin's families eventually meet together in battle, and Corrin is forced to side with either their adoptive family in Nohr, or their blood family in Hoshido, or choose neither side and fight them both. After the battle, the story continues with Corrin returning to their chosen family, or if they chose neither side, dropping into the Bottomless Canyon with Azura. Corrin's starts in the Nohr Prince/Nohr Princess class, a class exclusive to them and their child, Kana. In this class, they can wield swords and Dragonstones. They can also draconically transform parts of their body to attack when attacking using Dragon Fang skill. With a Master Seal, Corrin can promote to a Nohr Noble and gain the ability to wield tomes, or to a Hoshido Noble and gain the ability to use staves. In addition to this, Corrin has a wealth of other options - they can reclass into their secondary class with a Heart Seal, their spouse's base class with a Partner Seal, or an A+ supporting character's base class with a Friendship Seal. As they are able to Support almost nearly every playable character in the game, this gives them a myriad of possibilities for reclassing. Finally, they can use any of the various special reclassing items to access otherwise inaccessible classes, such as the Dread Fighter, Ballistican, or even character-specific classes like Marth's Lodestar class. Since Fates, both the default male and female versions of Corrin have appeared in other Fire Emblem games. Both versions of Corrin can be summoned as illusory allies in Fire Emblem Echoes: Shadows of Valentia using the matching Smash amiibo, and both versions appear as units the player can recruit in the crossover game Fire Emblem Heroes. 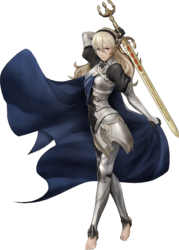 Female Corrin also appears prominently as a playable character in Fire Emblem Warriors, with the male version of Corrin available as well outside of story mode. Corrin (male) as he appears in SSB4. Corrin is a downloadable newcomer in Super Smash Bros. 4 released on February 3rd, 2016, alongside Bayonetta. Instead of being bundled with a new stage, like with the other DLC newcomers, two new music tracks for Coliseum and Castle Siege will be unlocked alongside Corrin. Corrin is placed currently at 13th place out of 55 total characters on the SSB4 tier list, ranking them at the top of the B tier. Corrin's reach is their strongest positive, with their forward smash being notable as the longest reaching in the game. Their range is also complimented well with their overall decent frame data, and, much like Marth, they possess a tipper that deals significantly more knockback. Yet, just like Marth, Corrin does have issues scoring KOs from up close, as the launch power in their non-tipper hits have relatively little knockback. They also suffer from overall mediocre mobility in both the air and on the ground. Currently, Corrin has fairly solid tournament representation and results to their name. Corrin joins the battle from Fire Emblem Fates. Born in Hoshido but kidnapped by Nohr at a young age, Corrin was brought up by Nohrian royalty. Descended from the First Dragons, Corrin has the power to transform into a dragon. In Smash, Corrin can change parts of the body into lance-like hands and feet that have a long reach that deal more damage at the tips. Corrin from Fire Emblem Fates was born a Hoshido royal but kidnapped as a child and raised by the Nohr royal family. Descended from the First Dragons, Corrin has the power to transform into a dragon. In Smash this means lance-like hands and feet with a long reach whose tips deal the most damage. Use this reach to inflict high damage at a distance! Corrin's side special, Dragon Lunge, is no normal attack–skewer a surface with a lance-like arm, and it will suspend you in the air. Pin an enemy while doing this, and you can keep them in place and then follow up with a flying kick forward or back or just jump up. You can only thrust the lance once before landing. Corrin's side special Dragon Lunge is no normal attack–skewer a surface with a lance-like arm and it will suspend you in the air. Pin an enemy while doing this and you can keep them in place, then follow up with a flying kick forward or back, or just jump up. You can only thrust the lance once before landing. Corrin (male), as he appears in Super Smash Bros. Ultimate. Corrin returns alongside the series' entire playable cast in Super Smash Bros. Ultimate, this time as an unlockable character. Corrin (female) as she appears in SSB4. Corrin (female), as she appears in Super Smash Bros. Ultimate. Corrin is the second character in the series to be added before the worldwide releases of their game (after fellow Fire Emblem representative Roy). However, Roy's game wasn't released anywhere at the time of his debut in Smash, while Corrin's had by then been released in Japan. 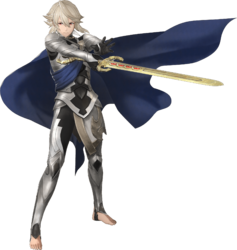 Corrin's male artwork in SSB4 is similar to his official art in Fates, albeit with his left hand in a different position and his sword being angled more downwards. The female artwork, however, is identical to her official art in Fates, but she now wears black stockings covering her inner thighs. Both artworks feature the two wielding the Omega Yato instead of the standard Yato. Corrin is one of two Fire Emblem characters to utilize a weapon other than their sword, being their dragon form. The other character being Robin. Corrin was the most recently debuted playable character following their release as DLC for SSB4. 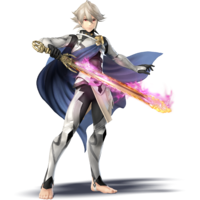 While Corrin is traditionally depicted as female by default in non-Smash Bros. appearances such as in Fire Emblem Warriors, advertising for Fire Emblem Heroes, and the official trading card game Fire Emblem Cipher; Corrin is depicted as male by default in both Super Smash Bros. 4 and Super Smash Bros. Ultimate. Corrin, Snake, Wario, Luigi, and Yoshi are the only fighters to feature material from upcoming games in Smash - Corrin's release as DLC in Smash 4 featured the English version of Lost in Thoughts All Alone, a version that was not released at the time since Fire Emblem Fates had not yet reached the West. Corrin is the only Fire Emblem character whose onscreen appearance does not involve teleportation onto the stage using warp magic. As with Pokémon Trainer, Robin and the Inklings, the male and female variants of Corrin have been established as separate entities in Fire Emblem Warriors, where one gender can encounter the other as an enemy in a bonus mission. This page was last edited on April 1, 2019, at 18:26.